Are you looking for a protein pick-me-up to give you the energy boost needed to enjoy spring? Quinoa is a tiny seed and whole grain that is light and easy to prepare. It is high in protein and tastes great in many recipes! This salad makes a great snack or lunch and dinner option. And it is easy to store in a container or send it off to school with the kids! Rinse quinoa and strain through a fine mesh. Add rinsed quinoa to a pot and dry toast for a few minutes. Add 2 cups of water with a pinch of sea salt and bring to a boil. Simmer quinoa for 15 minutes until all the water has absorbed. Turn off heat. Let it sit for a minute or two. Remove quinoa and spread out on a plate to cool. 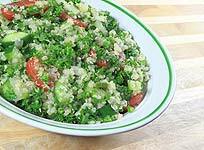 Place quinoa into a bowl and combine with chickpeas, onions, tomatoes, cucumbers, spinach parsley and mint. Mix dressing and toss into the quinoa mixture, and gently stir from the bottom up.